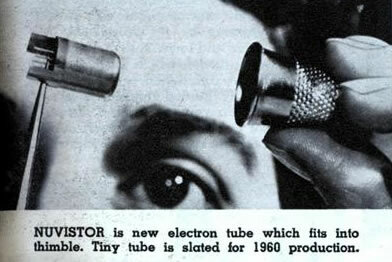 Small radios that fit into the ears like hearing aids or ear buds. Mildred wears two of them; none of that painful reality stuff for her. The little mosquito-delicate dancing hum in the air, the electrical murmur of a hidden wasp snug in its special pink warm nest. The music was almost loud enough so he could follow the tune. Without turning on the light he imagined how this room would look. His wife stretched on the bed, uncovered and cold, like a body displayed on the lid of the tomb, her eyes fixed in the ceiling by invisible threads of steel, immovable. And in her ears the little Seashells, the thimble radios tamped tight, and an electronic ocean of sound, of music and talk and music and talk coming in, coming in on the shore of her unsleeping mind. The room was indeed empty. Every night the waves came in and bore her off on their great tides of sound, floating her, wide-eyed, toward morning. There had been no night in the last two years that Mildred had not swum that sea, had not gladly gone down in it for the third time. A classic description of the human animal in the age of technology. For a current view of the state-of-the-art in Seashell radios, see the following commercial product - the Lobeman. It turns out that these radios were not so far off; Bradbury wrote the novel in 1953; take a look at these pictures from Modern Mechanix magazine in November, 1959. 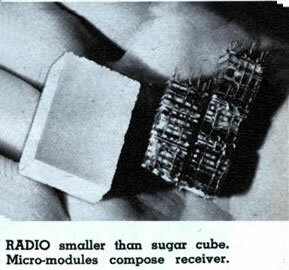 The article describes it as "radios as small as sugar cubes."